When it’s December in New York – even a warm one – and you’re offered an all-expenses paid trip to Mallorca and mainland Spain at the end of January, you’d be a fool to say no. You might also forget that it’s winter even in the Mediterranean. Unfortunately, this four-day sojourn coincided with a rare storm front that brought such strong winds through the Balearics as to plunge the temperatures towards zero in Mallorca, hard work when you’re there for an outdoor concert at midnight; the same storm dumped snow across much of the country and left the cities of Murcia and Madrid both feeling much like northern England in February. 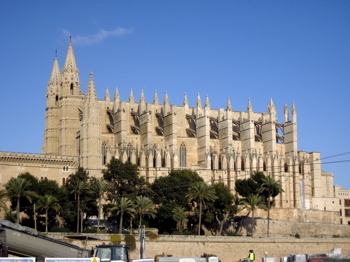 The Cathedral in Palma, Mallorca: only took 400 years to build. As Brit readers probably know – maybe even from experience – Mallorca’s tourist capital of Palma is full of Indian restaurants, English pubs and British newspapers, but it’s also got a beautiful marina dotted with expensive and cheap boats alike, a delightful old town, plenty healthy food of its own, a stunning Cathedral and a thriving viticulture. In between the work, I visited the island’s two best wine bars, befriended the owners, tasted more local wine that I’d expected and learned enough about the island’s indigenous grapes to merit a separate future post. Murcia I couldn’t get my head around. We were there on a Saturday, yet by midnight just about all the bars and restaurants were closed, the one exception being an indie nightclub that was not set to get going until 3am. Walking round the cold, wet, rather tatty city streets in forlorn hope of finding anything that would serve food, I felt like I could have been in any anonymous British city in the 1970s, except for the fact that I felt safe in my solitude. I finally headed back to the hotel in the hope of room service, which had finished hours ago; a 24-hour grocery I was sent to around the corner was closed. Rather than head back out across town to the club, I ended up going to bed hungry – and sober. At least this gave me the energy to enjoy Madrid. (Unlike some of my friends who vowed that the Murcia indie nightclub – the name is 12 and 1/2 for anyone headed that way soon – was rocking hard from 4am until 6.) There’s something about the Spanish capital that I just love: the people have a sparkle to their eyes, a bounce to their step and a pride in their home town that is positively contagious. 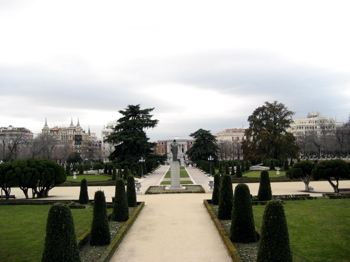 Madrid has history, it has architecture, it has parks by the dozen, it has football (of course), and it has a thriving, classically Continental café, restaurant and bar culture. To my delight, our effervescent hosts for the evening took us to yet another fantastic wine bar where my rather random choice of wine – Enate from the Somontano DO – so impressed the waitress that she brought over a complimentary tray of aged Manchego “to open up the wine.” (The fact that, by pure coincidence, she had also served as a translator for the band on a previous trip may have contributed to her generosity.) Sunday night turned into Monday morning with me clutching a glass of the bar’s best Ribera del Duero, which at all of €2.4 rendered it about a third the price you’d pay for anything similar in London or New York. On Monday morning, the rain didn’t seem to have stopped the people I was meeting with from smiling and laughing and acting like it was Friday evening all over again. Madrid, you’re the greatest.